Cellular Fantasy, a retail and office spaces specializing in cellular communication products, inhabits a converted bank. The project began as an attempt to transform the existing period architecture but reinventing the exterior of this 30 year old bank within the city of Santa Monica proved to be a bureaucratic impossibility. Presenting a fortress-like façade to the street, the existing structure hovers above on the corner site like huge mausoleum. Constructed of travertine stone the building was designed by Millard Sheets, a California artist, who late in life made a lucrative second career designing buildings throughout Southern California for the Home Savings of America bank as backdrops for large pictorial murals also of his design. The client’s goal was to transform the existing building, renovating it for use as a commercial venue for cellular technology sales and service, and creating an emblem of the progressive global communications. 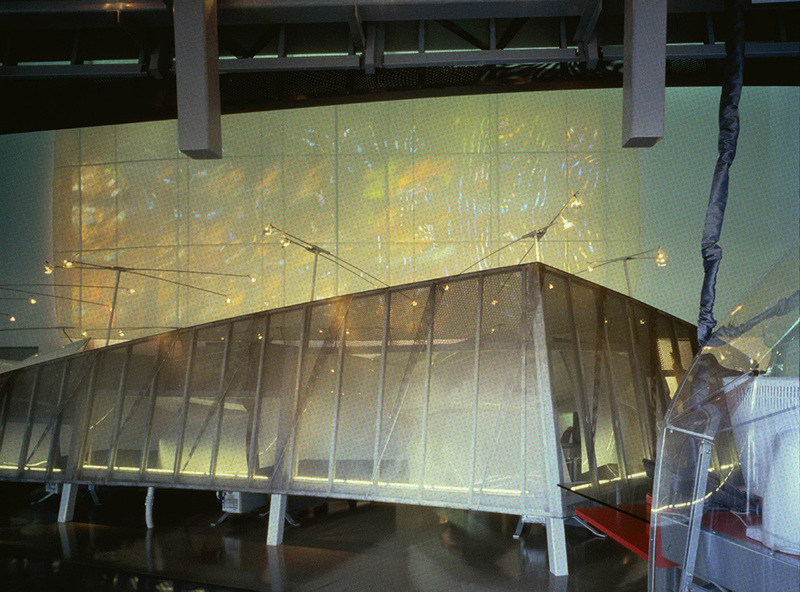 To make that happen, we developed a strategy to create a building consistent with a contemporary hub of communication. With the goal of coaxing the building away from it’s funereal appearance we proposed to skin the entire façade with a blue-glass curtain wall, covering everything except the mural. The hue of the glass would accentuate the mural and the reflections in the glass would mollify the nature of the travertine cladding, giving it a softer, more penetrable feel. Unfortunately, following a contentious city hearing marked by disagreements which included architectural historian Diane Ghirardo’s statement that the existing structure was an “an example of Italian Fascist Architecture” and “a mediocre one at that” the city of Santa Monica Planning Commission did not agree to authorize our proposed renovation. Despite the subsequently rejection of Historical Landmark Status for the building by the Santa Monica Landmarks Commission, we had to return to the drawing board and reconceptualize the client’s program as an insertion of the program within the existing shell. The client challenged us to abandon the normative concept of a segregated workspace and cubicle system and instead create an environment maximizing transparency and visibility within the workplace environment. Reinventing the cubicle as a hybridized architectural furnishing element we created a contemporary cocoon-like workstation for each worker. The interior ambiance of the former bank building is transformed through the layering transparent, semi-transparent, and perforated surfaces deployed to differentiate spaces for the store and office functions, and providing modulated levels of visual privacy. A series of translucent polyurethane shields overlap to surround each desk, giving the employees the impression of a private work environment, while maintaining visible connections between co-workers. Efficiencies and communication are enhanced shadowing and partial sightlines through the cocoons allowing employees to maintain an apprehension of one another’s presence. 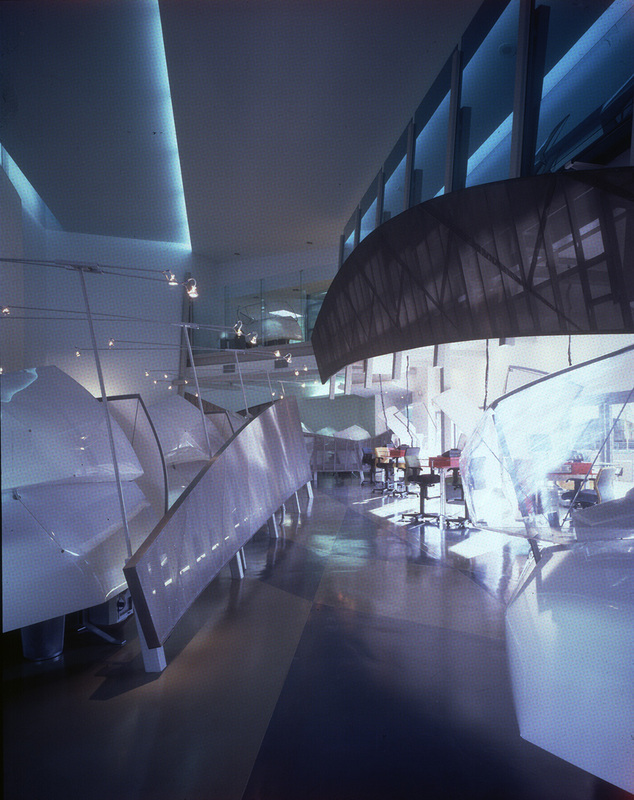 Open areas between the cocoons also increase opportunities for visual connectivity. Private management offices are exposed to view on the second level of the space and equipped with security and privacy features including electro-chromic glass walls that with the flip of a switch are transformed from opaque to clear, offering increased privacy when required. The program demanded a space which was conducive to commercial sales and in keeping with a strategy employed in many of our projects we employed a type of space making which avoids the creation of forcefully defined spaces. 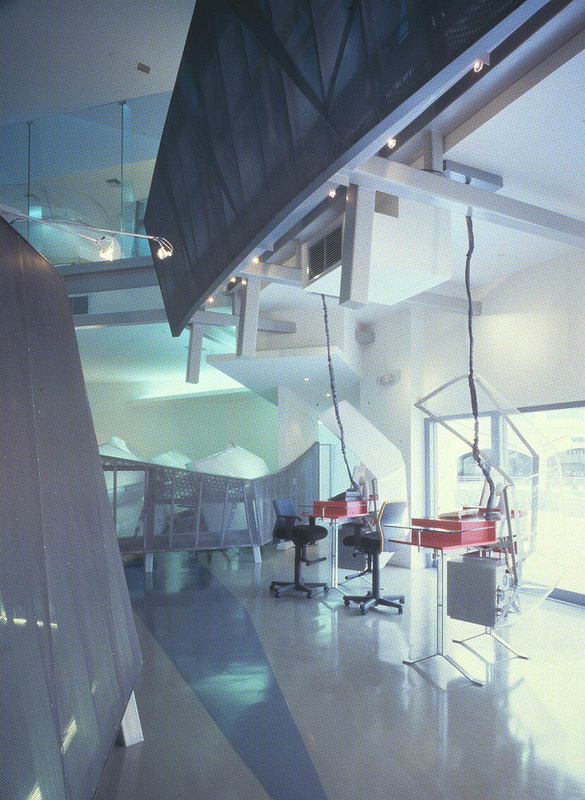 Maintaining fluidity in the extension of space we were able to free the environment of closed and confining areas. Through encouraging directional spatial flows and accentuating the natural volume of the building’s core the intervention is nestled in the belly of the space. 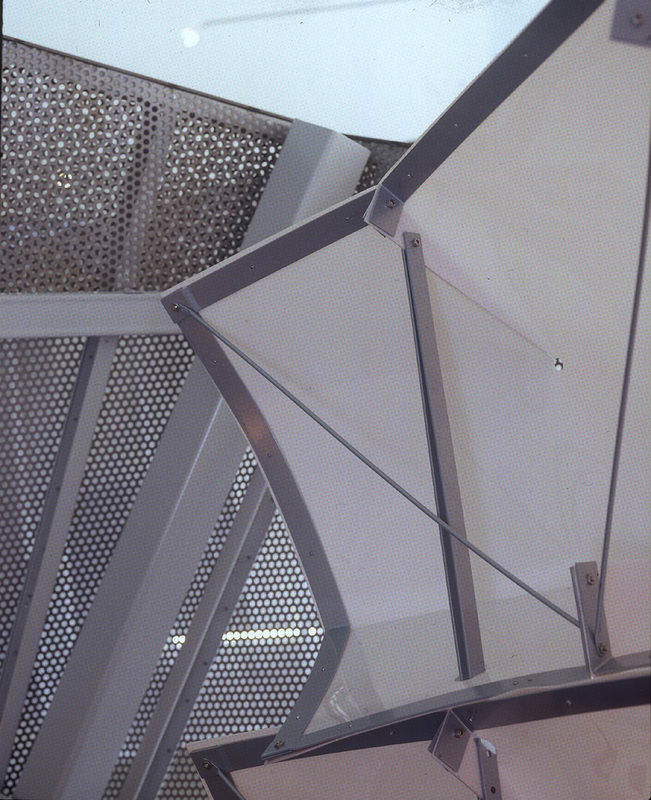 Taking advantage of an enormous East-facing stained glass window as part of the building’s protected exterior shell, we paired with it an interior screening element. 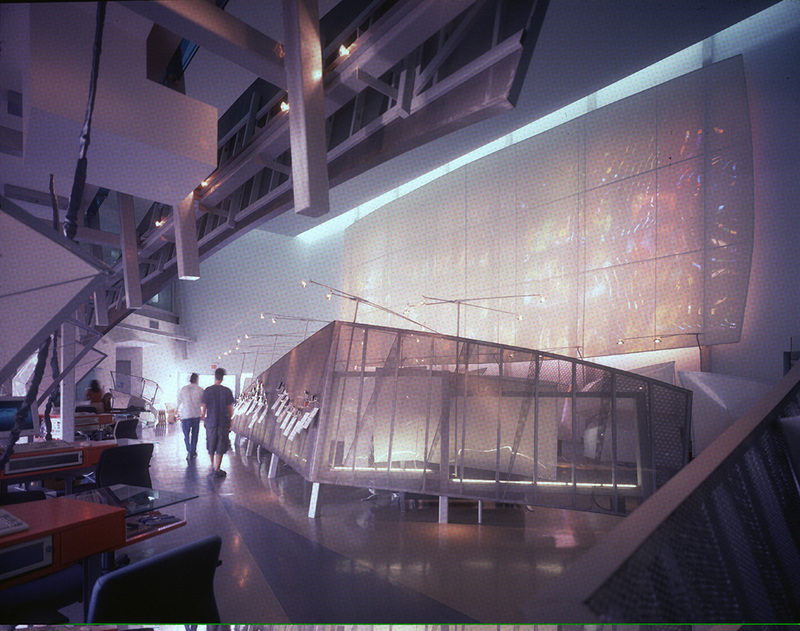 Comprised of layers of perforated plastic fabric shifted to create an abstract effect the elements interact washing the space with vibrant specular colored light that like a living painting softens as the day progresses. In this way the basic envelope remains untouched while at the same time is fundamentally transformed. A coalescence between the movement and volumetric play of interior elements with the existing element results in a spatial experience which exceeds the sum of its parts and defies expectations. The reinvention of this Santa Monica landmark required the reconciliation of an immutable past and with a radical future. 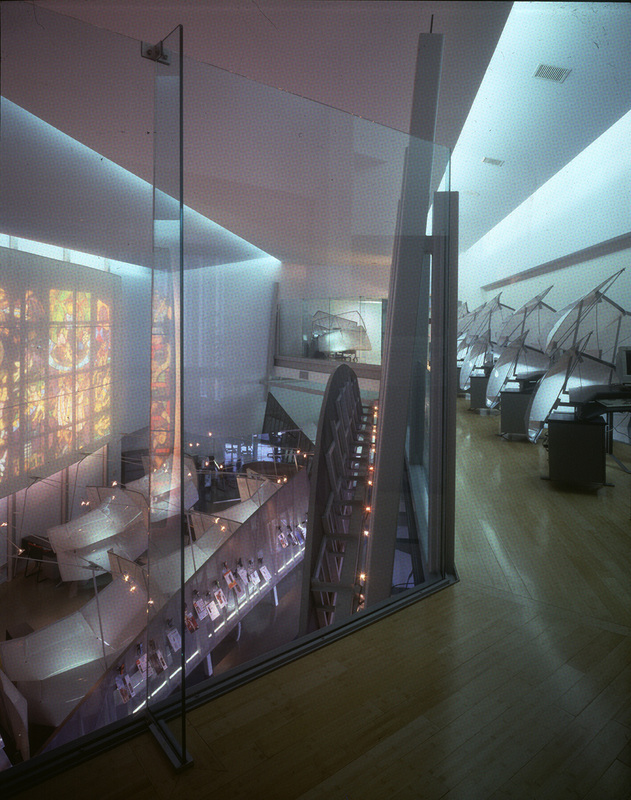 When completed, the travertine shell restored, new signage and landscaping added, the mural, sculpture, and stained glass window subtly transformed, it was clear that we had succeeded in both maintained the integrity of the past, while simultaneously stretching our perceptions to the edges of our rapidly transforming world. A project that had originally has sought to fundamentally transform a place from the outside in, now transforms experience from the inside out.